Students join the team for one week only! 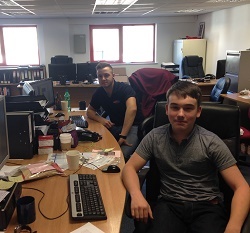 Last week we had 3 students from Wakefield City Academy working with us on their work experience placement. Pavel and Nafisa expressed an interest in the installation and maintenance of security systems, and therefore accompanied our engineers out on their calls, and Ryan was interested in business administration and spent his week in the office. Nafisa and Pavel shadowed 2 different engineers, going into customers’ homes and observing servicing and fault fixing calls. Ryan spent time with the contracts manager, sales manager and marketing manager learning about the different aspects of running a business and working on tasks set. On completion of his week he said that he had enjoyed his time here and was definitely interested in pursuing further learning in business administration after his GCSEs. We’d like to thank Ryan, Pavel and Nafisa for their hard work and enthusiasm last week and hope that they might consider a career in security when the time comes. previous The aesthetic beauty of… an alarm bell box?